How to Develop Disruptive Products Using AR and VR? Much like many modern technologies, virtual reality, and augmented reality were first encountered in sci-fi movies dating back several decades ago. Despite the small number of initial sources, every VR or AR platform developer took a different route. This is something that arose from the need for differentiation. Diversity is always a good thing, as it increases the chances of meeting the different needs of different people. There’s also a great number of applications, a fact that makes choosing the right technology and the right platform even more important. For VR, the uses range from meditation and fitness to gaming and customer service. AR, on the other hand, opened a whole new world of opportunities for advertisers and marketers. Companies got to exemplify how their product would look or work in the consumers’ environment, without even having to buy it. IKEA’s AR-enabled mobile app placed virtual Swedish furniture in people’s homes, for them to see if it suits well. Volkswagen even went as far as to develop an AR troubleshooting manual for one of their concept cars. Bear in mind that both of these examples took place in 2013, and AR has evolved a lot since then. 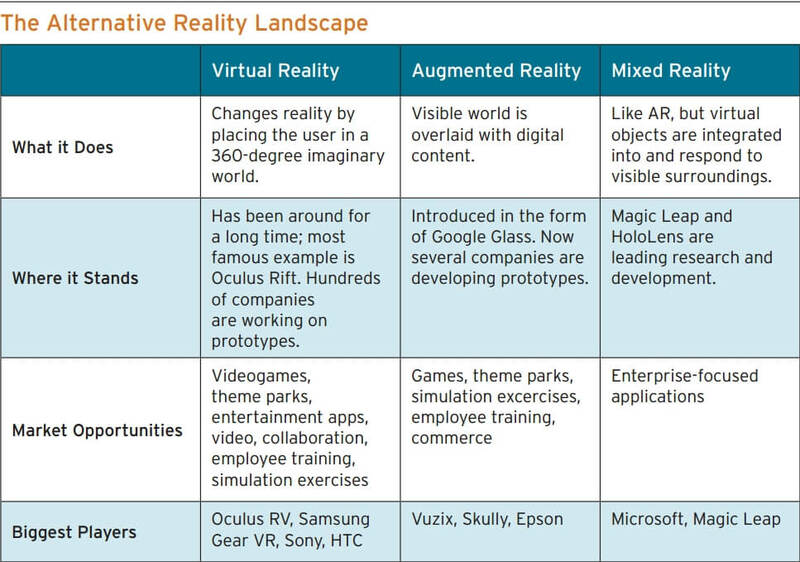 With Google, HTC, Sony, and Microsoft all battling for AR or VR supremacy, it’s hard to tell what platform to choose for developing disruptive products. That’s without even taking Facebook’s Oculus VR into account. One thing remains certain, though. To provide an even more immersive and impressive experience, any company pursuing disruption will have to develop either a product for these technologies or a VR/AR component to their existing products. How Is AR and VR Content Consumed? When it comes to the devices alternative reality apps can run on, there are several options, depending on the technology. Augmented reality apps only add an overlay to what the users are already seeing. Because of the simpler approach, these apps can be used either on mobile devices or on smart eyewear such as Google Glass. Things are a bit more complicated for VR content. This is consumed using headsets that immerse users in a completely new environment. Depending on the type of headset, users might be able to watch VR content either on the go or indoors. In the first scenario, the display and processing power are provided by a smartphone that’s equipped with a gyroscope and an accelerometer. The headset itself can be as simple as a cardboard contraption, as is Google Cardboard, or a bit more solid, as is the Samsung Gear VR. In either case, the experience depends on how fast the attached smartphone can render the graphical details, and how good the display is in terms of panel technology (IPS, AMOLED) and resolution. Oculus Rift and HTC Vive take a different approach. These are standalone headsets that were developed mainly with gamers in mind. To get the content to the built-in stereoscopic display, they need to be connected preferably to a Windows PC, since MacOS and Linux support is still not that good. The headsets include all of the necessary sensors and for the time-being outmatch the resolution of smartphones. On top of that, they come with proprietary controllers that enable users to move more than just their head in the virtual world. Regular gaming controllers can also be used, but may not provide the same experience. 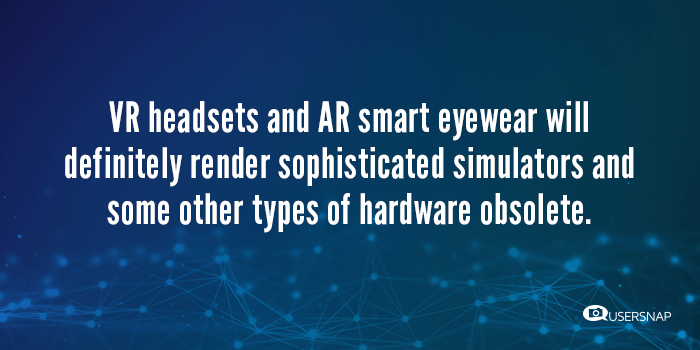 While still requiring smartphones or desktop PCs to run, VR headsets and AR smart eyewear will definitely render sophisticated simulators and some other types of hardware obsolete. As the form factor decreases and the resolution increases, we’ll have VR apps that replace Ultra HD 60” 3D Smart TVs and complex flight simulators for a fraction of their cost. We often hear about how our smartphones have more processing power than NASA’s computers that landed Apollo 11 on the Moon. 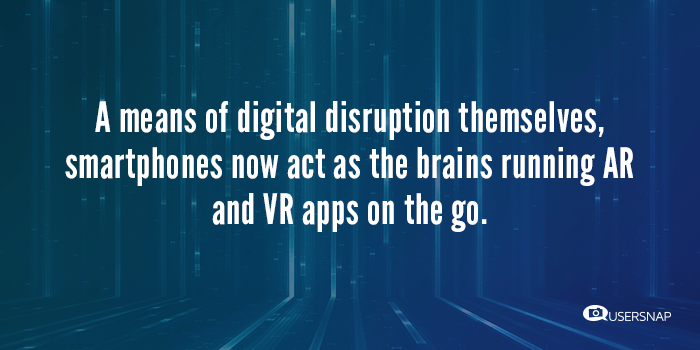 A means of digital disruption themselves, smartphones now act as the brains running AR and VR apps on the go. However, that’s not always the case, as some applications’ requirements of computational power exceed the capabilities of a smartphone. Modern desktop computers have more graphics horsepower than even the latest flagship smartphones. That’s particularly important in the context of VR. After all, Oculus Rift have such high requirements that it even determined graphics card manufacturers to develop and sell VR-ready video cards. If you’re just getting started with full-fledged VR headsets, and want to build a PC specifically for that, this comprehensive guide can help you. If you want to do more than to watch AR and VR content, you could always proceed to develop apps for alternative reality platforms. That assumes that you already have the required software development skills. First things first, to develop and design an app that can be used with the HTC Vive VR headset, you need a development environment. Unity3D is the number one game development platform, and that’s for a good reason. It’s available for free for beginners and hobbyists, but professionals need to pay a subscription for the more advanced customization features. If you’re taking this route, you should download and install the software, and make an account to use it. Next, download the SteamVR plugin for Unity3D, which is also available free of charge. By downloading it straight from the Unity3D Asset Store, you’ll make sure that you have the latest available version. Once you’ve installed it, watch the following tutorial to get a better grasp at how HMD and controllers are set up. From here on, you can unleash your creativity and start building your first piece of VR software. Steam’s library of VR games reveals that there are certain titles developed for HTC Vive, others that are exclusive to Oculus Rift, and some that work with both. Because there are certain hardware differences between the two, developing a digital product that works on both might be challenging. If you’re looking to develop VR apps for smartphones, there’s a different story. Using Google VR SDKs for Unity, you can develop apps for both Android and iOS. If you’d rather develop augmented reality apps, Vuforia makes a great SDK for Unity. This one’s also free for beginners and hobbyists. As evidenced in this tutorial posted on Microsoft’s Windows blog, after installing the software, you should create a database for the markers. There are different types of markers depending on the target, which in turn can be a single image, a cuboid, a cylinder or a 3D object. Developing the AR app starts with adding the camera and setting how many images to capture in order to determine the target. World orientation is yet another variable that should be taken into account. Next, you need to load the database, test the camera and add the first basic marker. Once the marker is detected, a 3D object that’s either prefabricated or designed by you spawns on top of it. These are just the first steps in developing an alternative reality app. To create a disrupting product, you should perfect these skills or find a team that has them, and use them to bring innovative ideas to life. Developing a mobile alternative reality solution in tandem with a desktop one could prove difficult. There are roadblocks and constraints that could prevent companies from achieving the expected success. First of all, there’s the matter of additional costs. With each new platform, companies would have to spend additional money on tools, development and human resources. Secondly, multi-platform products imply more time spent on developing, testing and launching each version. Not at last, each platform requires different technical skills for the development of the product. Hiring new people or training the existing ones to acquire a new skillset comes at a cost. Truth be told, there will be differences not only in the code, but also in the design and the user experience. The different operating system, resolution and functionalities of each platform will dictate how the digital product needs to be developed and designed. Prior to venturing on developing a multi-platform product, it is mandatory to conduct market research in order to see if there really is a need that could be fulfilled. Additionally, user testing might prevent companies from launching VR or AR digital products on a platform where these wouldn’t work or wouldn’t be wanted. Muse’s recently launched music video for Revolt provides a 360-degree experience and is best consumed in VR. While not a product per se, the video acts as proof that VR can disrupt entertainment beyond gaming. Facebook definitely got the snowball rolling in this direction when it launched 360 Videos a bit over a year ago. Back in March 2016, Samsung took virtual reality to the club. The company offered us a preview of how the future of music gigs would look using Gear VR. This is a headset powered by Oculus that uses smartphones from the Galaxy line to immerse attendees in the performance. vTime, the mobile social VR network, made it possible to share experiences in virtual reality. One of the best aspects about it was its compatibility with both Google Cardboard and Samsung Gear VR. One option users had was to choose an environment and hold their meetings there. As an alternative, they could scan a photo, upload it and use it as a background for their social or professional meeting. Autonomy’s Aurasma has been around for more than 3 years, but it’s now that it has really taken off. The AR technology that’s powering the app has been used by Mohawk Fine Paper to give its quarterly publication a new dimension. Aurasma is also a classroom friendly AR solution, showing that these emerging technologies have a role to play in education, as well. We shouldn’t forget about 2016’s most popular AR product, Pokémon GO, which has been adopted overnight by millions upon millions of users. While the mobile app encouraged users to go out more and explore their surroundings, they didn’t always pay attention to the things happening right next to them. As American custom IT outsourcing corporation Cognizant pointed out in their white paper titled Disrupting Reality: Taking Virtual and Augmented Reality to Enterprise, there’s more to disruption than these two technologies taken separately. Their point is that the two can be combined to obtain mixed reality solutions. The best part about mixed reality is that there already are platforms for it in the form of Microsoft’s HoloLens or Magic Leap’s eponymous product. The only thing missing now is a plethora of digital product development companies to fill in the blank spaces with revolutionary apps and disruptive products.